Robert Behnken and Nicholas Patrick maneuvered pressurized mating adaptor No. 3 into position around 9 a.m., making fine adjustments as needed to line up four sets of motorized bolts in the common berthing mechanism. The bolts then were driven home in a two-stage procedure, firmly locking PMA-3 to Tranquility by 9:28 p.m.
Before the shuttle Endeavour's launching, PMA-3 was bolted to the Unity module's left side hatch. To clear the way for attachment of Tranquility, PMA-3 was moved to the Harmony module's zenith port. Tranquility, launched with a seven-window cupola on its outboard hatch, was attached to Unity's left-side port last week. The cupola was detached and moved to Tranquility's Earth-facing, or nadir, port early Monday. That cleared the way for PMA-3 to be mounted in its place on the outboard end of Tranquility. Inside the space station, meanwhile, the astronauts opened up the cupola Monday evening and began its initial outfitting. During the crew's third and final spacewalk overnight Tuesday, Behnken and Patrick plan to pull off two large insulation blankets protecting the cupola's seven windows and remove launch locks holding aluminum shutters in place. At some point after that, the astronauts will open the shutters and enjoy a panoramic view of Earth. 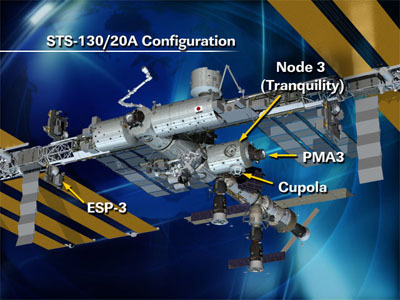 A robot arm control station will be moved into the cupola Wednesday. After two spacewalks and extensive robotics operations, the astronauts looked forward to a half-day off beginning at 11:39 p.m. A procedures review for a third and final spacewalk over night Tuesday is on tap at 4:09 a.m. and crew sleep is scheduled to begin at 8:14 a.m.